A friend and I, I'll call him Jack..., decided we wanted to do some ocean sailing and agreed on a date to go to my mothers house in southeast Georgia. We had decided we were tired of just lake sailing and needed an adventure. Jack lives about a hour from my house, so the morning we were to leave and I got up around 4:00 am, made sure the trailer and boat were secure and the lights worked. Jack was supposed to be up and ready, wrong. He lives in an old two story firehouse from the early 1900's. I did not have my cell phone with me, so I spent the next 1 1/2 hours throwing rocks at his bedroom window and finally he had got up to go to the bathroom and heard the rocks hitting his window. I forgot to mention my friend is some times forgetful and a little hard of hearing. He came down and we loaded his stuff in the boat and car and away we went. The 900 mile trip down was very uneventful. It takes about 14 hours to my mothers house. The next morning we get up late, around 8:30 and my mother, who is 80, has a great southern breakfast for us. I didn't think Jack could hold all those buttermilk bisquits with syrup and butter. Who knew a guy from St. Louis, MO loved grits and eggs too. Come to find out my friend Jack was born in Texas. We ..Jack...that is finished breakfast around 9:00, not the early start we had planned. Left the house to drive over to St. Simons Island, GA to the boat ramp. Rigged the boat and started to launch when several powerboats came up to the ramp to pull out. We waited, the power boat guys all looked at us like we were from Mars. We found out about 6 hours later when we came back to load the boat onto the trailer. The boat dock sits parallel to the river and a bridge is south of the ramp. The current just happens to be going toward the bridge, about 3 knots. We tied a hundred foot painter to the bow and a 50 foot line to the stern. We should have had two 150 foot lines. I had to dive into the water, about 4 foot deep, and keep the boat off the pilings. We knew then why everyone looked at us like we were from Mars. You have to power your boat onto the trailer. The next morning we find another ramp better suited for sailboats. It was also a lot closer drive. 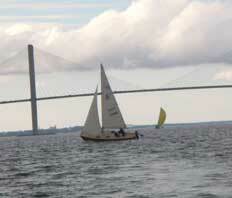 We sailed about three miles to the sound and seen other sailboats out like they were going to have a race. I called on the vhf if we could join in and was told to go to the dock at the marina and sign up for the race. Here we are in a 1977 San Juan 21...we must have looked like Sanford & Son to these people. They were nice people though. They had 34 foot to 42 foot boats and a whole lot of local knowledge. We did all right, 5th out of 9 boats. We got caught against a strong tide. Jack and I wondered why most the local boats took a port turn at the start of the race. Actually John said we should follow this one boat,but I didn't. By the time I figured out what was going on, too late, we were caught in the tide. Some of the other sailors told us later while having a cold beer, that little thing is fast. That made me feel a little better. We sailed every day for the next five days, exploring every gunkhole for about ten miles. We learned how to use the tide to our advantage. We had dolphins swim with us everyday. I was taking pictures of a pod of dolphins about 200 yards off the port bow when a dolphin came up about 4 feet from behind me and blew out his air. It startled me and I almost dropped Jack's camera overboard. We also had to dodge very large cargo ships. We know who really has the right of way. The Coast Guard guys would come out everyday and fly by us. They must have been training because they would come flying up real close to us and then blow the horn once to pass us on the starboard side. By the time we heard the horn they were almost past us. I didn't have time to reply with my horn. These guys must have been doing 40-50 and they would come to within 50 feet of my boat everytime. Anywhere from 4-6 guys on board. A worker at the ramp at the park where we launched told us they train like that for when they have to board hostile boats. Yeah, it sure as h--l gets your attention all right. We learned that our navigation was pretty sound, our boating skills sharp, and we loved every minute of our time on salt water. We are planning more adventures for the near future. Maybe the Great Lakes, Chesapeake Bay, The Hudson River and Erie Canal, Kentucky Lake and TN River to the Tenn-Tom Waterway to Mobile, AL and the Gulf, the FL Keys, and others to be named later. If Jack can't make it, I'll try to get someone, but if not, I guess I'll go single handed. 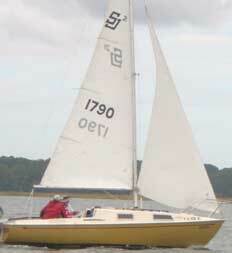 If you can find a better little boat than the San Juan 21, you have a good one. It sure is a sweet little boat. Thanks Clark Boat Company. You did good.